D.Jeffrey Bingham and Glenn R. Kreider, Eschatology; Biblical, Historical, and Practical Approaches (Kregel Academic, 2016). 501 pgs. Eschatology (or the study of the end) has fallen on challenging times. What was once understood as a facet of the gospel intended to provide the Church with hope, has now become fodder for end times prognosticators. This shift in emphasis represents a system that relegates the discussion of Eschatology proper to secondary status since it is erroneously seen as theories about the tribulation, rapture, and millennium to the exclusion of emphasis on Christ’s Second Advent and the hope that is provided therein. 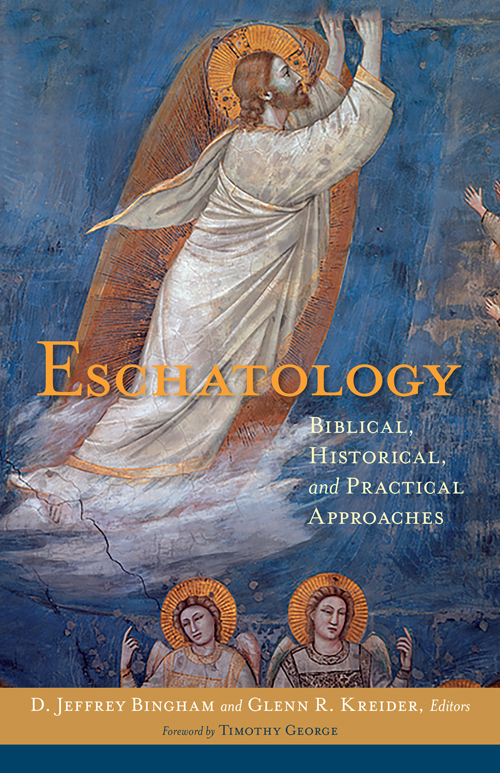 Eschatology; Biblical, Historical, and Practical Approaches, is a festschrift (a collection of essays written in honor of a particular scholar) dedicated to Craig Blaising in honor of his sixty-fifth birthday. Blaising’s work extended to theological method, Patristics, Wesley, but he is most notably known for his work in eschatology and more precisely Progressive Dispensationalism, hence the subject matter of this festschrift. This work is without the end time’s speculations that typically make up books on eschatology. Rather, I see this work as an attempt to make inroads with the blessed hope for which eschatology was intended. No work on eschatology would be complete without reviewing the subject matter in light of Biblical Theology. Part 2 provides such a treatment with discussions on Old Testament teachings of the future, covering the Pentateuch, historical books, wisdom literature, and ending in the prophets. The discussion continues into the New Testament covering the writings of John, the Synoptic Gospels, the writings of Paul, and Hebrews. Having covered Biblical Theology, Part 3 discusses Historical Theology. In so doing, it traces the teaching of western patristic writers like Justin Martyr, Irenaeus, Origin, Athanasius, and Augustine and in the Reformation era, such authors as John Calvin and the Anabaptists. Other collective bodies such as the Baptists and contemporary evangelical theology are also dealt with. This treatment of historical theology helps the reader understand how the biblical data was understood in various traditions, eras, and among different Christian denominations. Lastly there is the “Practical” approach mentioned in the subtitle. Part 4 rightfully concludes the work on eschatology with a section on how to properly inculcate eschatology into ministry. I realize this might sound foreign but it is important reminding us that all good theology is practical. There is much to commend in this book. Primarily that the message of hope is central to the study of eschatology. It isn’t uncommon to find in works of eschatology a speculative approach accompanied by an argumentative tone that leaves the reader wondering how this is at all relevant to the Christian faith. Such an approach is detrimental to this important biblical teaching. In Paul’s first letter to the Church of the Thessalonians he mentions the reason for him talking about future things is because he doesn’t want them to be uninformed like those who have no hope (4:13). It is evident that Paul’s message about the future was a message of hope. He further says, later in this discussion, to use this message to encourage (4:18). This book is not however without its problems. The Dispensational system from which Craig Blaising is very fond of, tends to be presupposed throughout much of the book. This might be appropriate considering this volume was dedicated in Craig Blasing’s honor. However, it would be in error to present this volume as “…helpful to the student seeking to progress toward an evangelical, holistic, integrative, systematic perspective on the doctrine of the future (p.32)” since this type of language assumes an unbiased presentation of the teachings found in scripture. From an evangelical perspective, the presuppositions found in the various forms of Dispensationalism impose discontinuities throughout redemptive history that are not necessarily revealed by Jesus or His disciples who seem to understand redemptive history as one continuous crimson thread of redemption. Thus, for those who come out of a Dispensational background or have a pre-commitment to Dispensationalism, there is much in this volume that you will appreciate. Personal rating is 3 STARS out of 5.